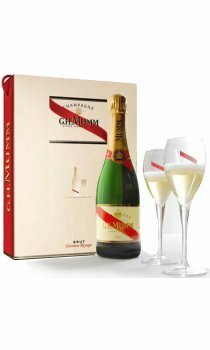 Mumm Cordon Rouge Flute Gift set! A true classic with a unique character and irreproachably consistent taste, it's name alone conjures up a whole world of flavour. All the richness and finesse of the Mumm vineyard is expressed in Cordon Rouge. In the late nineteenth century, this champagne was decorated with the famous red ribbon, as a tribute to the Legion d'Honneur. In their new finery the bottles were presented to Mumm's best customers. The decoration became the hallmark of one of the world's most renowned champagnes, Mumm Cordon Rouge!